Last week we had some bad things to say about email—mostly that field service businesses rely too much on email and their websites to communicate with their customers and prospects. So this week, to make up for dissing this venerable form of communication, we're going to talk about all things email—from how email automation can help your business to how to write marketing emails people want to read. If you read last week's post and completed the challenges, you have a nice communications plan all set up; if not, we recommend you do that before tackling your email. Once you have a communications plan for your business, you'll have a better handle on what you send to your customers and prospects, and how you send it. 1. What types of things do you typically email? Announcements, for example when you're closed due to the weather. Responses to questions from customers and prospects. Updates on when the parts for a job will arrive. If you email it, it should be on the list. Yes, that includes the funny videos of botched DIY plumbing repairs you email to your favourite customers. 2. What could (and should) you be emailing that you aren’t? Payment receipts. Instead of your engineers handing customers hand-scrawled receipts, it could be more efficient to have them zap receipts right into customers' inboxes. Marketing. You might email marketing messages instead of confining them to your website, where you hope customers and prospects will stumble upon them. Reminders. You could replace sending zero appointment reminders and service reminders with emailing snazzy-looking automated ones. Requests. Instead of asking customers for a review only when you happen to remember, how about sending an email automatically after every job asking them to rate your business on review sites? 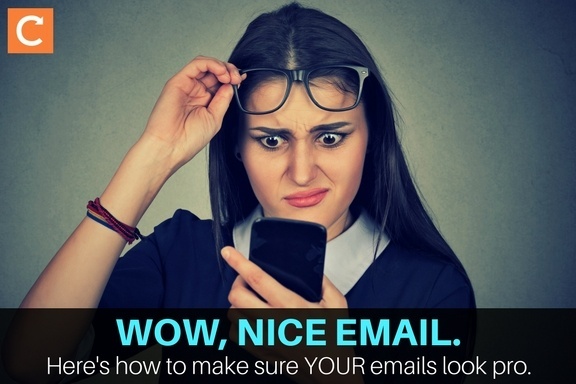 When you're running a field service business and taking care of day-to-day tasks like, you know, actually serving customers, it can be hard to keep on top of all the new, more efficient email techniques that keep cropping up. Add any ideas to your to-do list and either schedule a time to set them up, or delegate them to your office staff or a freelancer. Also: Are you seeing a trend here? A lot of these business-boosting messages can be handled through email automation, so you set them up once and never have to think about them again. There's no excuse for not spending a few minutes to make your business more efficient and effective. 3. How professional are your emails? Your logo on invoices and receipts. Professional-looking design. Or professional-looking non-design...more details on that later. Timeliness. Meaning you respond to emails from customers and prospects within a reasonable amount of time. Many experts insist you respond within the hour, but come on—you have a business to run. If a customer has an emergency, they will call or text, not email. Missing anything? Again, schedule or delegate. As with most of the other tips in this article, these are set-it-and-forget-it tasks. If you're like most people, when you look at your inbox you feel one of those corny stock images of an avalanche victim with just their hand sticking up above the snow. Schedule a certain time during the day when you respond to people who email you, so you're not checking and responding all day when you should be running your business. Keep emails short. Shorter emails get faster responses anyway. Remember that not all emails require (or deserve) a response. Here's a LinkedIn article by yours truly that explains why. Knowing this will keep your head from exploding every time you look at your inbox. What we will talk about here is how to organise and keep track of all your important emails so your customers, prospects, suppliers, and business bank account stay happy. Every email system has its own way of organising emails. For example, Outlook has folders whilst Gmail has labels. Learn how to use them and you'll never have to worry about lost emails again (or an inbox with 10,000 emails in it). There are plenty of tutorials online, like this one on how to manage Outlook 2016 folders and this article on how to organise Gmail emails with filters and colored labels. Email open trackers let you know when someone has, well, opened your email. This is key when, for example, you've emailed requested information to an estate agent and want to make sure they've received it; if they don't open the email within a couple of days, you'll know you should follow up. Tracker providers like Yesware and Newton offer free trials so you can get a feel for which works best for you. Warning: Checking to see who's opened your emails can become addictive! Schedule emails to be sent later. This is helpful if you're sending an email at 12:00 am and don't want to receive a response at 12:01 am. Set up reminders for yourself if you don't get a response to an email in a certain amount of time. 'Pause' your inbox so incoming emails don't flood in until you're ready for them. Great for those time when you need to focus for a few hours and don't want to be distracted by incoming email. These little hacks help you track and organise your emails so important messages don't fall through the cracks. Even better, Boomerang is free for up to ten messages per month. Do email marketing like a pro. If you're looking for a good way to reach your customers and prospects, try email. The various email marketing platforms out there range in price from free (for small businesses) to yikes! (for giant organisations) and let you segment your subscribers, track open and click rates, and much more. There are enough studies, data, and information about email marketing to fill a whole shelf full of books, but here are some best practices that will make sure your emails get read—and get the response you want. If you use an email marketing platform like MailChimp—which has a free plan for businesses with up to 2,000 subscribers, and, oh yeah, it integrates with Commusoft—you'll see they let you segment your subscribers so you can send the right messages to the right people, which will cut down on unneeded responses, spam complaints, and other distractions. For example, with proper segmenting you'll send emails about a boiler recall only to those customers who actually have the affected brand of boiler, and emails promoting your commercial work only to commercial customers. Most email marketing platforms offer instructions on how to segment, so you'll get the hang of it quickly. You don't need fancy design. A pro template is nice, and subscribers say they prefer it to plain-text emails, but a study by Hubspot shows that subscribers actually open and read plain-text emails at a much higher rate. So if you don't have the resources to create custom templates for your marketing emails, don't sweat it. Low-key subject lines and email copy can actually perform pretty well. People who subscribe to email lists quickly get burned out on exclamation point-ridden emails, so try standing out from the crowd by giving your readers a welcome breather from the hype. Make sure subscribers can quickly and easily unsubscribe from your emails; if they don't want to be there, you don't want them there. That means no hidden links in the same color as the email background, no making subscribers log in to unsubscribe, and no pop-up saying 'Are you sure?'. Click and done. Be sure your emails all have a call to action. In other words, let your readers know what you'd like them to do. Are you giving a talk at the local community center and want your customers to attend? Are you offering a discount on boiler check-ups and want people to schedule one today? Do you have news you want people to share? Make the ask, and make it easy for readers to comply. That's it! Seriously, you don't need a complicated design, a clickbait subject line, or a long email that carefully pushes all the right buttons. Just be you. Email marketing platforms also offer very detailed statistics on who's opened your email, who clicked on what, and who's been ignoring you for like ever. Nothing's worse than having to pay more for your email platform because you have too many subscribers for the free plan—and then discovering that half of those subscribers never open your emails. Experts recommend 'cleaning' your email list on a regular basis so you're not sending to addresses that no longer work and people who are just not that into you. Deleting people from your list is scary, but necessary; here's an article (by me) on the Content Marketing Institute blog on why smaller can actually be better when it comes to email lists. Ready to slice and dice your list? OptinMonster has a detailed tutorial that walks you through the process. On Thursday, February 1st, at 3:00pm GMT, we'll be hosting a webinar exploring the MailChimp integration feature—and we'd love for you to join us. Even if you're not a Commusoft customer (yet) and if you don't use MailChimp (yet), you can take part to see how it works; the information you'll learn is useful in any case. How to sign up to MailChimp for free. How to set up your Commusoft and MailChimp integration. How to create mailing lists in Commusoft. How to send a mass email using your MailChimp integration. Get more information and sign up by clicking the banner below. We look forward to helping you make the most of your email!